Residents of Kanton Island said they were malnourished and starving because a government supply ship hadn't been able to get there. A British sailor delivering a yacht from Hawaii to Australia may have been a life-saver for 24 inhabitants of a remote Pacific island. Yachtsman Alex Bond decided to make a stop Sunday at Kanton Island, part of the Phoenix Islands in the nation of Kiribati, during his trans-Pacific delivery voyage, according to a release from the British coastguard. Greeting him on the island were 24 malnourished residents, including 10 children. They had been living on only fish and coconuts for two months because a Kiribati government supply ship that normally brings their food had not been able to get to the island, CNN affiliate ABC News in Australia reported. The island, which is surrounded by several uninhabited islands, is about 2000 miles from and midway between Hawaii and Fiji in the Pacific. “We had no idea of the trouble they were in when we arrived. The adults were in a poor state and the children were suffering serious malnutrition,” Bond told The Falmouth Packet by phone. Bond gave the islanders the few supplies he could spare from the yacht and used a satellite phone to contact the British coastguard station in Falmouth, England, near his home in Penryn, British authorities said. “So far, we have been given a shopping list of provisions such as cooking fat, rice, sugar and flour,” the British coastguard said. British authorities contacted U.S. Coast Guard authorities in Honolulu, who notified the Kiribati consulate on the Big Island, Lt. Gene Maestas of the 14th Coast Guard District told CNN. "That's the extent of our involvement thus far. A relief ship is supposed to be bringing supplies to them but we have not been asked for help," he said. “It is a beautiful island in the middle of nowhere, but their regular delivery of food had failed to show up and was at least five weeks away,” Bond said in the Packet report. “We’re not leaving until I know they are okay. They are wonderful people,” he told the Packet. Kanton, the only island in the Phoenix group with a permanent population, served as an air base for U.S. forces during World War II and later as a missile tracking station. "This is unbelievable to me. Why in the world would they live in the middle of no where, a place where they depend on the government to feed them. " Because THEY WORK FOR THE GOVERNMENT. They are on that island because IT'S THEIR JOB. They maintain an emergency airfield, an weather recording station, and so on. They're there WORKING. Since they're there for long stretches, some of them have their families with them. That has been explained in previous posts by several different people who, unlike the armchair commentators, have physically been there. They are on that island because that's where their job is - just like a lighthouse keeper, or an oil rig worker for that matter. Forget it's an island. Imagine it as an oil rig. Why would someone be there? Why wouldn't they be able to grow their own food? Why would they be dependent on what they ordered from outside suppliers? The answers are obvious, right? Now apply the same to employees of the government of Kiribati, stationed on that island to maintain government-owned facilities. It bothers me more than anything else, this drive to hate, hate, hate, condemn, condemn, condemn, not only without knowing anything about the situation, but in direct conflict with the actual facts about this situation. People don't know, and they don't want to know; they just want to exercise their hate. Seriously ... if Joe's Cheapskate Oil Co. goes bankrupt, and strands a crew on an oil rig out in the Gulf, are you going to say "Why were they there? Stupid breeds stupid. Let them starve" like you are here? No? Then why is it different if the base is an island instead of an oil rig, or the employer is a bankrupt government instead of a bankrupt corporation? Are hate and cruelty, callousness and bigotry, really the values we want to be known for? Are the the values of the shining light of freedom? Of the land of liberty? You are going to just love this. The Kiribati government isn't releasing the US to send the airlift because no one from Kanton Island has requested the food they said. 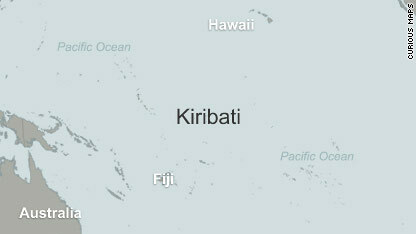 I guess it didn't occur to Kiribati that their radio could be down! The Kiribati government says it's not received any requests for food aid from residents on remote Canton Island. I think people who respond the way they do, saying the people of this island should learn to be self sufficient, are responding ultimately out of fear of not keeping what they have because it's going to someone else. I would think the people, when faced with the possibility of starvation, probably thought long and hard about anything they could possibly do to sustain themselves. Wouldn't you? They are people like us, we are people like them. It seems to me that Mr Bond responded out of love, not fear. Those are the usual two motivators. Well now Kiribati government is going to argue with the yachtsman there on the ground that they don't need food. Go figure! Yachtsmen in the central Pacific are disputing claims by the Kiribati government that it has not received requests for food aid from remote Canton island. UPS always claims to deliver to remote places. Do you think we could send Kanton Island some food via UPS? helga, I think it was FedEx that owes remote islanders some help... and not just soccer balls! I just checked UPS website and it would cost $338 send a 10 pound package of food to Kanton Island. I might could afford the food but can't afford the shipping. I tried to get a quote from FedEx but couldn't get it to work since I don't know their zip code or city name. I tried Kanton Island, Kanton, and Canton. Oh Well! Well it looks like these folks still don't have their food 7 days after being discovered. This is shameful! These people still don't have their food yet!!! I was born on Kanton, toward the end of the Korean War. Sadly, I did not get to grow up there. Someday hope to return. Lots of hostility in some of these posts. Too bad. Less angry, more friendly on all sides might be in order.